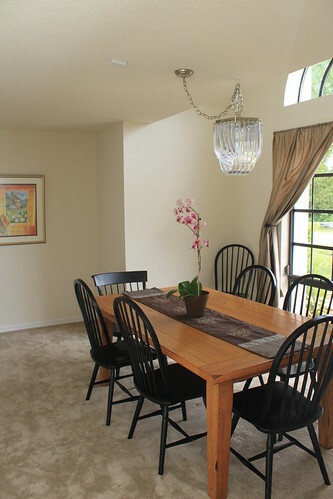 Table (it expands) and seven chairs via craigslist for $245. An additional chair from a consignment shop for $30 and another from Goodwill for $1. Silk curtains that I already had and weren't in use. I brought them down with us, hoping they'd fit one of the rooms and they went perfectly in the dining room with a quick hemming. Window hardware is from IKEA. Sean and his dad accompanied me to IKEA and they were a lifesaver. I had a list of everything I needed and they were out of some of the curtains I had planned on purchasing. While I did math in my head and figured out the least expensive way to change curtain plans, I was able to hand Sean a list of all the window measurements. He found and picked out all the rods and hardware for every window in the house and did an awesome job. They are all simple and white and at a later time we can add finales to the ends if we want. 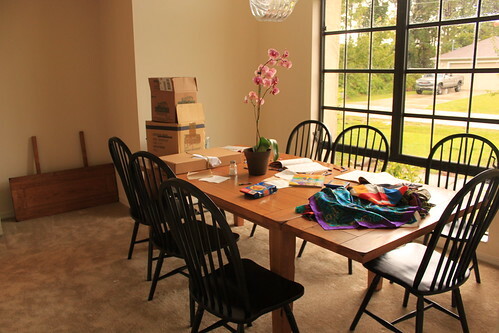 On our next trip down we plan on taking out the carpet because even though it is new, it is about the most impractical flooring for a dining area with children. What fun to creatively and economically furnish and decorate a different place! You're doing a great job! Will the house sit vacant while you're not there or will you rent it?